My family loves a traditional chicken mole recipe but it can be a time-consuming recipe. So most of you know me, “I ain’t got no time for that”! I have made it a mission to create a quicker chicken mole recipe without sacrificing that hearty mole sauce! This recipe my friends is my easiest chicken mole that will rock your socks! 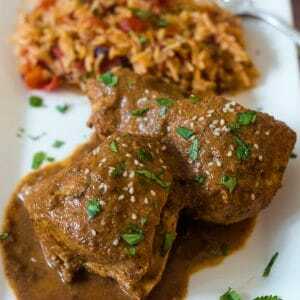 I have taken some of the traditional flavors of chicken mole and combined them with some of my easier shortcuts to create the Easiest Chicken Mole, without sacrificing flavor. Rather than rehydrating dried peppers for this mole sauce, use Chipotle Peppers in adobo sauce, easy peasy. Besides being a time-saver, the chipotle peppers add fabulous flavor as does the sauce. A mole sauce usually contains a sugar, nuts, sugar, chocolate, cinnamon, and spices. The chocolate should be a spicy chocolate or Mexican Chocolate. I love using Forte Aztez Soul Bar to make this Chicken Mole. The dark chocolate bar is made with a blend of roasted chili peppers including jalapenos and chipotle! Can Chicken Mole be a freezer friendly meal? Chicken Mole is freezer friendly. The chicken and sauce can be frozen together. Also, the sauce can be frozen on its own to use as a topper to enchiladas and tacos, etc. The sauce can keep in the freezer for about 4 months. How is Chicken Mole served? Serve Easy Chicken Mole with Spanish Rice, Cauliflower Rice, with Tacos, honestly, whatever tickles your taste buds! Shredding the chicken in the mole sauce is also fabulous. 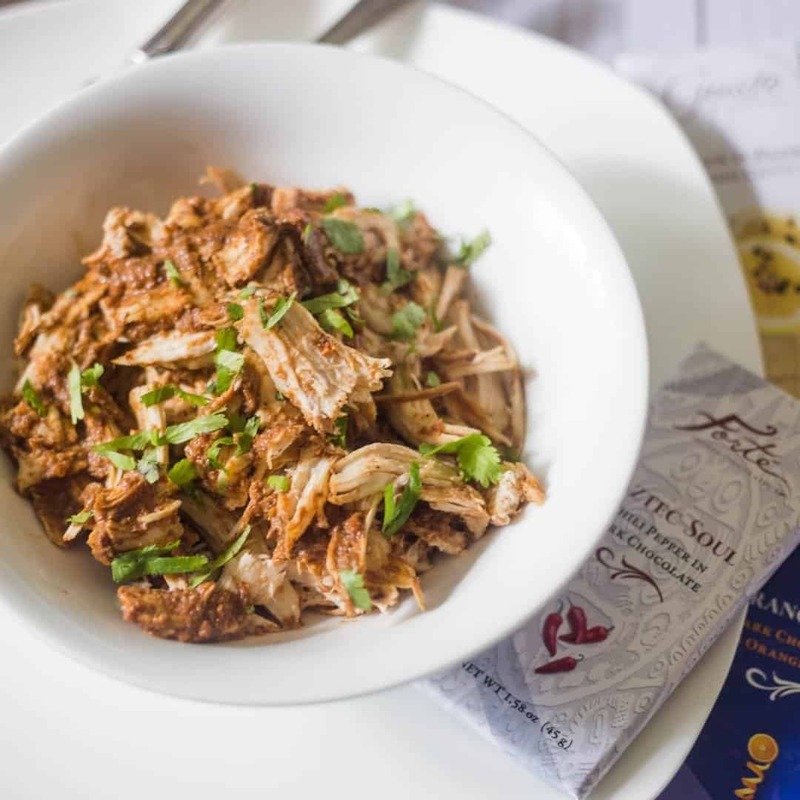 The shredded chicken can be served in tortillas, quesadillas, over salad greens! Let your imagination run with ideas! Is this Chicken Mole Recipe Low-Carb? Traditional Mole Sauce has tortillas added to the sauce. In this Easy Chicken Mole, by not adding tortillas to the mole, it cuts out extra carbs. The mole sauce tastes amazing and no one misses the extra carbs. To keep the meal completely low-carb, serve with Cauliflower Spanish Rice. Forte Artisan Chocolates are one of the wonderful sponsors of #Choctoberfest2018! Their chocolate flavors are unique and delicious! I encourage everyone to experiment with their chocolates and branch out to make savory recipes as well! Last year I made a savory Chocolate Pumpkin Chili! Forte’s Aztec Soul would be a great addition to chili! Gusto Lemon & Pepper in White Chocolate is another of their chocolates. I have so many recipe ideas to experiment with this chocolate. The chocolate would make a great savory sauce! I love the Orange Jazz Chocolate for cakes, cupcakes and ice cream! 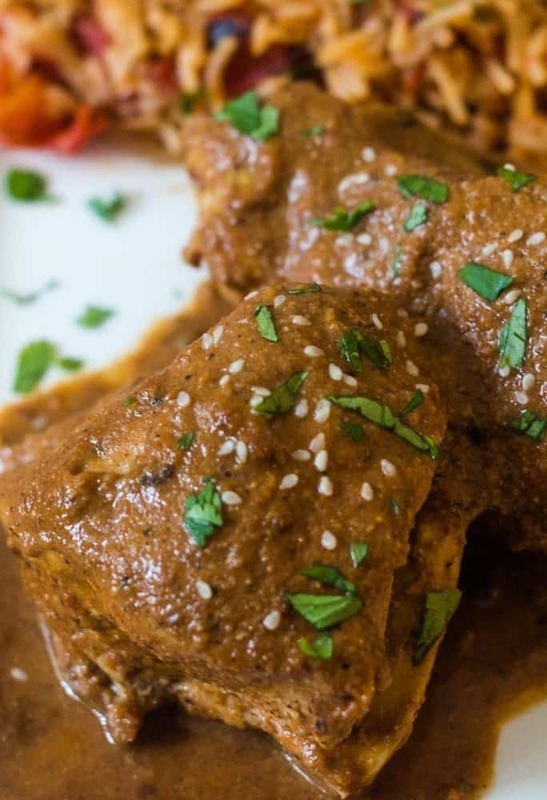 When you order chocolates through Forte Artison Chocolates to make this Chicken Mole or to enjoy their chocolates with other fantastic recipes, use code CHOCTOBERFEST2018. You buy 3 bars and get 1 bar free! Another fun event that Forte Artisan Chocolates is having right now is a Holiday Bakeoff! Check out the details and submit your creations to their Facebook or Instagram page. Good Luck! Dutch Oven: Lodge makes great Dutch Ovens.I love them, durable, various colors and sizes! Ninja Blender/Food Processor: This is the Mother of all Blenders! Breaks up nuts, ice, you name it! My favorite blender ever! Season chicken breasts with salt, black pepper, garlic powder, and onion powder. Heat olive oil in a large Dutch oven over medium heat, add chicken and brown the chicken breasts. Set aside. To the Dutch oven, add sliced onions, saute about 5-7 minutes. Add garlic and saute another minute. Add in cinnamon stick, cloves, pepitas, and almonds. Saute for about 5 minutes. Mix in Chicken Stock, orange juice, chipotle pepper in adobo sauce, diced tomatoes, peanut butter, Forte Chili Pepper Dark Chocolate, spices, and raisins. Simmer for a few minutes. Turn heat off, Carefully add the mole sauce to a blender. Once the mole is smooth, add back into the pot and put the chicken breasts into the pot too. Let the chicken and mole sauce simmer about 25- 30 minutes. The internal temperature of the chicken should be 165 degrees. Serve with Spanish Rice, tortillas, or Cauliflower Rice for those on a low-carb or keto diet! A Mexican recipe that is traditionally simmered for a long period of time. This Chicken Mole is ready in less than an hour and is full of flavor! Serve with Spanish rice, cauliflower rice or shred the chicken an make enchiladas, quesadillas or tacos. Keep Dutch Oven over a medium heat, add the other Tablespoon of olive oil and saute the onions until soft and add in minced garlic, cinnamon stick, pepitas, chopped almonds, cloves, and raisins. Saute a minute or two to let the flavors blend. Add in the diced tomatoes, chicken stock, orange juice, chipotle peppers in adobo sauce, peanut butter, Chili Pepper in Dark chocolate, sugar, chili powder, and cumin. Season with salt and pepper to your taste. Stir and let the flavors blend about 10 minutes. Shut off the sauce. Let cool a minute. Place the sauce in the blender, Use a hand towel to hold the lid on the blender while you puree. This prevents the blender top from coming off due to the heat of the liquid. See Note 4 Please! Once mole sauce is smooth, return to the Dutch Oven. Return the chicken to the Dutch Oven. Turn heat to low/medium to simmer chicken and mole sauce to completely cook the chicken breasts. The chicken should be 165 degrees when cooked through. This should take about 25-30 minutes. Depending on the size of your chicken breasts. Serve with sesame seeds, pepitas, chopped cilantro, Spanish Rice, or Cauliflower Rice. Note 1: Removing the skim reduces fat, so I prefer to take it off. If you prefer the skim on, by all means, leave the skin on the chicken breasts. Note 2: For this recipe, I prefer fire roasted tomatoes, however, if only regular diced tomatoes are available, they will work in this recipe. Note 3: The cinnamon stick gives a great flavor but again, you can use ground cinnamon. Note 4: Very important, blending hot liquids!! When using a blender to puree hot liquid, use caution. Use a hand towel to cover the lid and keep your hand on top of the hand towel. This ensures that the liquid does not pop the blender top off. It is #Choctoberfest2018, run by a wonderful group of bloggers at The PinterTest Kitchen ! Check out all the information to enter to win great prizes from our sponsors in my Welcome to #Choctoberfest2018 post! Mole sauce sounds soooo good. I never heard of this but I’m definitely want to try it. I’m saving this recipe and making this for my family for weekend. I bet it taste just fantastic! I hope you try the Mole and enjoy it! So I have to admit I have only tried mole once…and I was not a big fan. This looks and sounds so amazing though that I am willing to give the whole thing a try…and if I tell the kids that there is some chocolate in dinner they will totally be all over it (minus the spice) = winning!! I was with you on Mole for a long time! My kids love it and I was determined to make one that i would eat too! We love this recipe! This sounds delicious and I love that it’s a one-pot dish! We’re definitely going to have to try this! I had no idea chicken mole was so easy to make. Just tonight the hubs and I were talking about what to make for dinner. I’m in need of more chicken recipes because I need to switch it up in the kitchen a little to introduce more flavor! Jessica, this is easy and delish! I hope you and your hubs enjoy the recipe! This chicken mole sounds SO good! I’ve eaten it in restaurants before, but never tried to make it at home. Love that you have this easy version. My family would be so happy if I made this for them. Cannot wait to try it! Thank you Michele, glad you like the recipe! Enjoy! I love the idea of using chocolate that’s already flavored! And yes, this looks so easy… and these days I’m All About sauce, so I’ll be trying this! Cool! Anne, the Forte chocolate is delicious! I agree, its all about the sauce! Eileen, this chicken mole looks OUTRAGEOUS! I am so glad I found this recipe. We have been eating a lot of chicken lately and I have been getting bored making it the same way all the time. This will be perfect to try this week. I am loving the flavor combination. Thanks for the inspiration. Thank you so much Katie! You are the sweetest! I hope you and your family enjoy the mole! I have never tried mole before. This looks So flavorful and delicious.Pinned!! I’ve always wanted to try this but I’ve been intimidated by it. Thanks for breaking it down- I think I can give it a try now! I am glad you enjoy the chicken mole Allison! I hope you make it and the family loves it! I am a huge fan of Mexican recipes, especially those that use authentic spices. 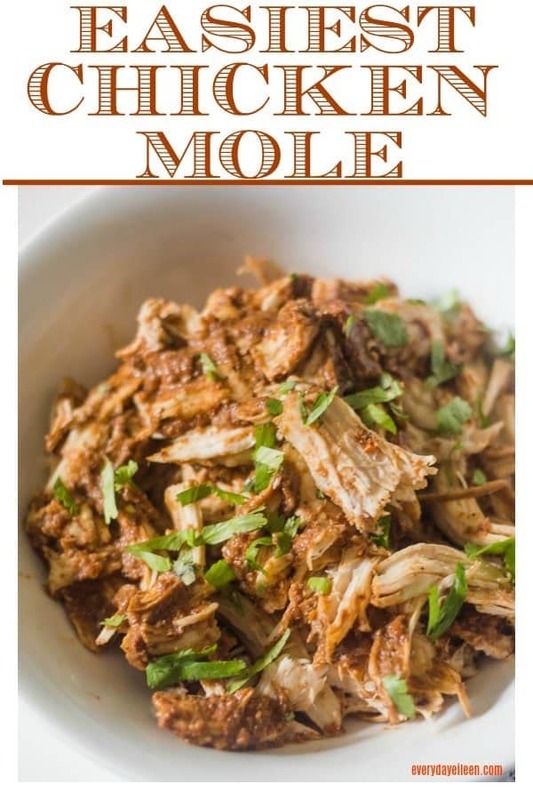 I will try this Mole recipe, so intrigued! This mole recipe sounds fantastic. So flavorful and aromatic. I love that you can serve it over cauliflower ice instead of with tortillas because we are pretty low carb at our house. Absolutely Jenni, I try to give a low-carb alternative whenever possible. Some of my kids are keto, so I try to make everything that can be altered for dietary needs. I’ve always been intrigued by mole sauce but I’ve never tried it. Your recipe is getting saved so I can finally try this delicious looking dish! Awesome Dominique! Ihope you check back in after you make the mole! I Have avoided making mole because it is too time-consuming. I love your recipe. Easy and it looks delicious! I love that you served it as a piece of chicken breast or pulled. Very versatile! I am so happy you are going to make the mole Terri! Thank you so much for taking the time to leave such a kind comment! Check back in after you make the chicken mole! Enjoy!